In The Book of Delights, one of today’s most original literary voices offers up a genre-defying volume of lyric essays written over one tumultuous year. The first nonfiction book from award-winning poet Ross Gay is a record of the small joys we often overlook in our busy lives. Among Gay’s funny, poetic, philosophical delights: a friend’s unabashed use of air quotes, cradling a tomato seedling aboard an airplane, the silent nod of acknowledgment between the only two black people in a room. But Gay never dismisses the complexities, even the terrors, of living in America as a black man or the ecological and psychic violence of our consumer culture or the loss of those he loves. More than anything other subject, though, Gay celebrates the beauty of the natural world--his garden, the flowers peeking out of the sidewalk, the hypnotic movements of a praying mantis. The Book of Delights is about our shared bonds, and the rewards that come from a life closely observed. These remarkable pieces serve as a powerful and necessary reminder that we can, and should, stake out a space in our lives for delight. 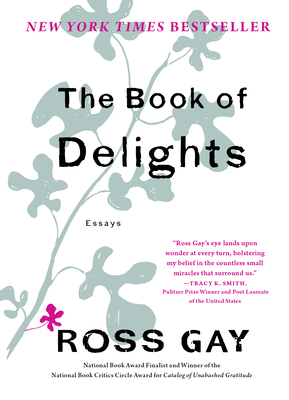 In addition to The Book of Delights: Essays, Ross Gay is the author of three books of poetry, including Catalog of Unabashed Gratitude, winner of the 2015 National Book Critics Circle Award and the 2016 Kingsley Tufts Poetry Award. Catalog was also a finalist for the 2015 National Book Award in Poetry, the Ohioana Book Award, the Balcones Poetry Prize, the Hurston-Wright Legacy Award, and it was nominated for an NAACP Image Award. He is a founding board member of the Bloomington Community Orchard, a non-profit, free-fruit-for-all food justice and joy project. Gay has received fellowships from Cave Canem, the Bread Loaf Writer’s Conference, and the Guggenheim Foundation. He teaches at Indiana University.